Duane Morris received the first TD Bank “U.S. Legal Champion” Award, recognizing TD Bank’s strategic law firms that provide valued work and high performance in the categories of innovation, service, TD value investment and billing management. 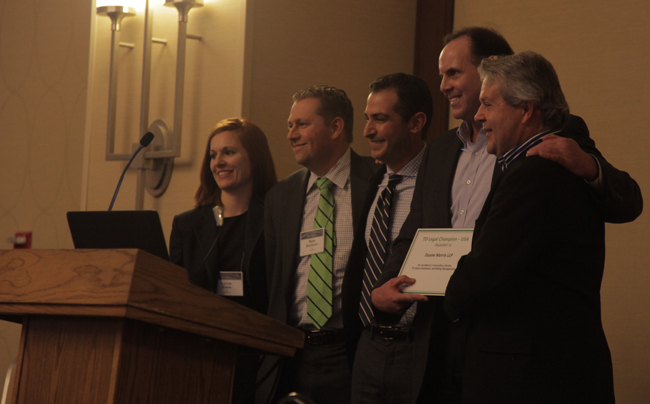 TD Bank deputy general counsel Leo Doyle presented the award to Duane Morris partner Alexander Bono at the trial practice group session at Duane Morris’ annual firm meeting. To learn more about this honor, which was reported on in the November 12, 2015, issue of The Legal Intelligencer, please visit the Duane Morris website. Duane Morris Attorneys Jason Ohta and Dan Terzian wrote this article about bank regulators and how the Treasury can order bankers to pay restitution for violating a law or for having a defective banking practice. To read the full article, please visit the American Banker website.